I’ve found a new friend at work and today she came over in order to do some Christmas crafts. 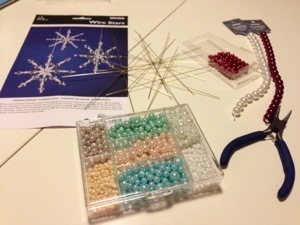 We had purchased steel stars and pearls in different sizes, shapes and colors. 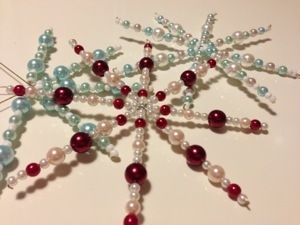 It was a lot of fun to make the pearl stars! Here’s my finished creations. Unfortunately I ran out of one type of the pearls so tomorrow I’ll try to get to the store before closing. I have 1,5 of the stars left to do! You are so crafty and creative!! ! i love your stars!